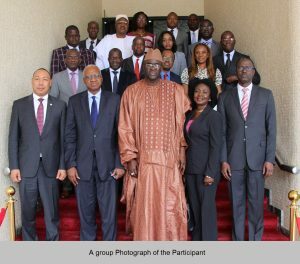 The Ministers of Justice of ECOWAS have examined and endorsed the draft Supplementary Act on the Enhancement of Powers of the ECOWAS Community Parliament. Their endorsement came during a two-Day meeting which ended on the 7th of December 2016 at the ECOWAS Commission in Abuja as the ministers appraised the work of the technical and legal experts who had diligently reviewed the texts of the draft of the Supplementary Report earlier. The experts included officials with sound institutional management expertise. The Enhancement of Powers Act is meant among others, to permit the ECOWAS Parliament to be involved in the process of budget as well as the oversight of activities of ECOWAS institutions. Delegates at the meeting considered the legal, political and financial implications of the proposals in the Draft, pursuant to coming up with realistic and pragmatic recommendations that would ultimately re-position the ECOWAS Parliament in the traditionally accepted form. After the election of bureau and adoption of agenda and work plan, there were presentation of reports of the technical committee on legal and judicial affairs, a consideration and adoption of the report of the technical committee on legal and judicial affairs, among others. 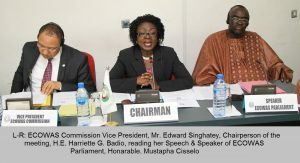 Affirming that the entire Community remains committed to achieving the objective of strengthening the regional Parliament, Vice President singhatey thanked the Speaker of the ECOWAS Parliament, Mustapha Cisse Lo for his ‘unequivocal commitment’ towards attaining the goals of regional integration in West Africa. 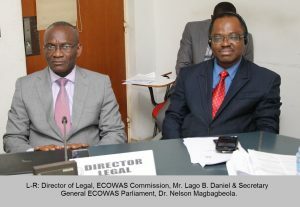 In order to review and refine the draft Supplementary Act, an inter– institutional Committee was established comprising of representatives of the ECOWAS Commission, Parliament and Court of Justice. At the conclusion of their work, the Committee agreed to adopt a gradual approach on enhancing the powers of the parliament from advisory to co- decision and subsequently legislative capacity in fulfilment of the provisions of Article 4.2 of the supplementary Act A/SP.1/06/06. The ECOWAS Parliament was set up as an assembly of Representatives of the citizens of the region and became operational with the inauguration of the first legislature in 2001. 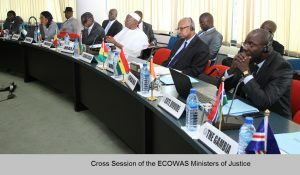 Among the senior officials on hand at the meeting were the chair of session and the Deputy Minister of Justice (economic affairs) of Liberia Counsellor Harriette Badio, the Secretary-General of the ECOWAS Parliament Dr. Nelson Magbagbeola as well as the Director, ECOWAS Legal Affairs Mr. Daniel Bodo Lago. Following the endorsement by the Ministers, the Draft will be brought forward to the ECOWAS Council of Ministers for recommendation and subsequently to the Authority of Heads of State and Government for final adoption.